These forests provide excellent thermal and hiding cover for big game animals. Bird diversity and populations approximating 125 species prosper in the low portions of the upland conifer forests. DESCRIPTION: Narrow rounded crown of thin foliage. LEAVES: Nearly round, abruptly short-pointed, thin. Shiny green above, dull green beneath. Turn golden-yellow in autumn before shedding. BARK: Whitish and smooth. On very large trunks becomes pale gray-green, with dark scars. HABITAT: Throughout Shadow Creek Ranch. FYI: The most widely distributed tree in North America, the leaves tremble in the slightest breeze. Beavers favor its smooth bark. Elk browse on the young shoots in winter and also may damage the bark by biting and rubbing it with their antlers. DESCRIPTION: Large tree with dark or blue-green foliage and a dense, narrow, conical crown of short branches spreading in close rows. Evergreen needles, sharp-pointed, slender and flexible; dark or blue-green with whitish lines. 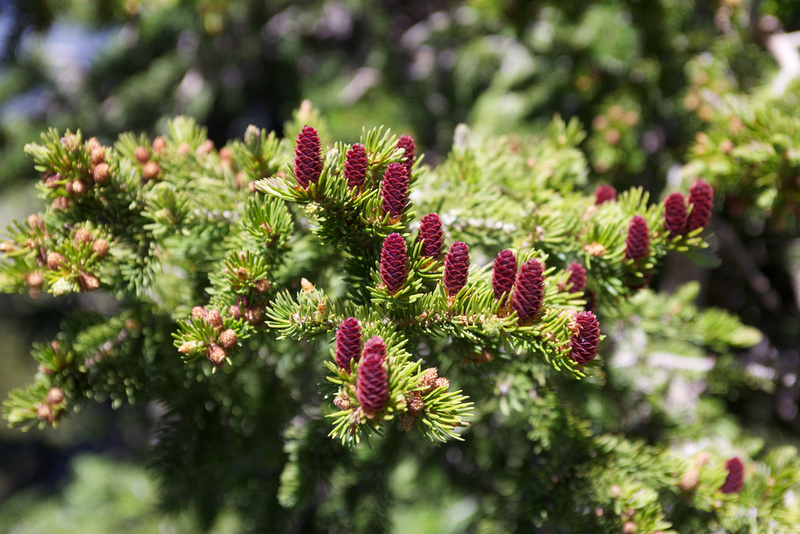 Cones are shiny, light brown, long, flexible, and hang at the end of a leafy twig. BARK: Grayish brown or purplish-brown – thin with loosely attached scales. HABITAT: Found near Subalpine Fir. FYI: Because this wood has excellent resonant qualities it is often used for piano sounding boards and violins. Squirrels and other small animals and birds like the thin, papery scales making up the cone. DESCRIPTION: A widespread western fir with dense, pointed, spire-like crown and rows of short, horizontal branches. Evergreen needles spread almost at right angles in two rows. Cones are dark purple and stand upright on the topmost twigs. BARK: Light gray, thin and smooth, with resin blisters. HABITAT: The upper ridges to timberline of Shadow Creek Ranch. FYI: The bark of this and other related firs is nibbled by elk. The leaves are consumed by grouse and the seeds eaten by birds and some animals. DESCRIPTION: Large to very large tree with narrow, pointed crown of slightly drooping branches. Evergreen needles are soft, dark blue-green. Cones are narrowly egg-shaped, light brown with thin cone scales. DIAMETER: 2' to 5’, sometimes larger. BARK: Reddish-brown, very thick, deeply furrowed. HABITAT: Rocky Mountain Douglas fir is chiefly found on rocky soils, in pure stands or in mixed conifer forests. FYI: Rivals the redwood in height. One of the world’s most important timber species. The foliage is enjoyed by grouse, deer and elk; birds and animals eat the seeds. DESCRIPTION: Trunks are slender, straight, and gray and the lower branches are usually missing. Narrow, dense, conical crown. Evergreen needles, yellow-green to dark green and slightly flattened. Cones are egg-shaped and yellow-brown. BARK: Gray or orange-brown, furrowed into scaly plates. HABITAT: The high ridges of Shadow Creek Ranch. FYI: American Indians used the slender trunks of these trees as poles for their tents and teepees.